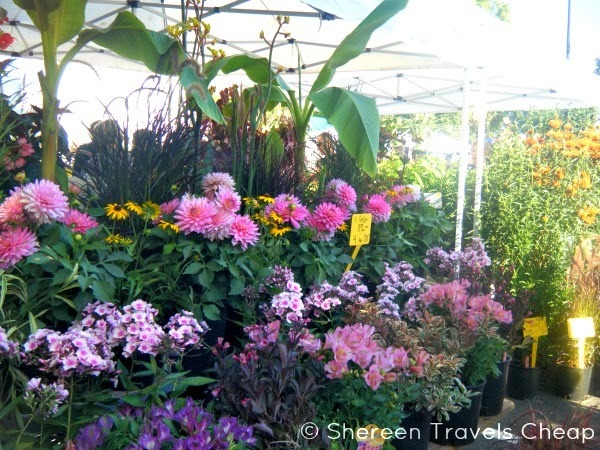 The farmers market is a fantastic destination for travelers. A farmers market can be the ultimate for the budget traveler, because you can get affordable local foods, beverages, flowers and more! 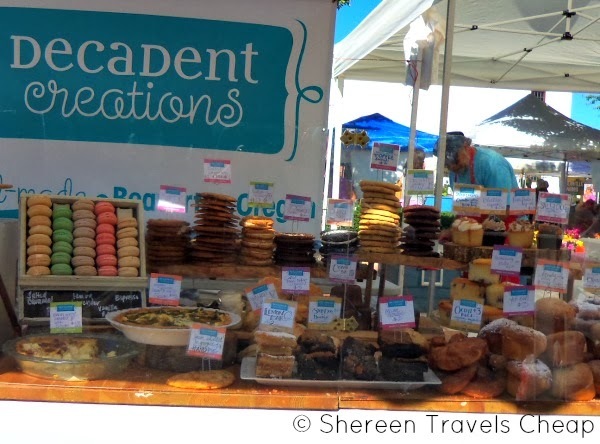 Find everything from cheese and breads to jams and local crafts. Most markets are in or next to city parks – perfect locations to enjoy a picnic lunch on a bench. I never leave one without a bag full of local yummy foods. Generally, I shop the market down the street from my house, but I always like to hit up ones when I travel. You can easily buy food to eat on-site or to make in a hotel room that has a kitchen. How delicious does a hand pie sound? Or a fresh bagel with cream cheese and a side of fruit? You could even pick up a bottle of wine or some beer to go with your other goodies. Imagine spending around $20 for your lunch and food for later or the next day? Our farmers market not only had the regular things you would expect to find, but also mixed salad greens and even fresh meat from local farms. You could have grilled up some grass-fed lamb steaks with a side of organic veggies and amazing salad greens and then had a gluten-free cupcake or flavorful gelato for dessert. Many markets I’ve been to also sell spices, too, so you can make even more native dishes, while still saving money. One of the things I like to take home as a souvenir is local foods and spices from other parts of the world. While you can’t bring back fruits, veggies or plants from many places, you can bring back jarred sauces, jams, coffees, candies and more. Not only are you helping out the local farmers and merchants by shopping the markets, you can get something homemade, home grown and/or unique to your vacation destination. Often, you can get other handmade products at the farmers market, like clothing, décor, soaps and beauty products. While the packaging may not be totally professional looking, you know it was made with care and you are getting high-quality items, because the vendors don’t have factories full of employees. Even if the products are a little more expensive than you were expecting, it can still save you money over traditional stores and the food will certainly save you over eating in a restaurant, even if you get something ready-to-eat. 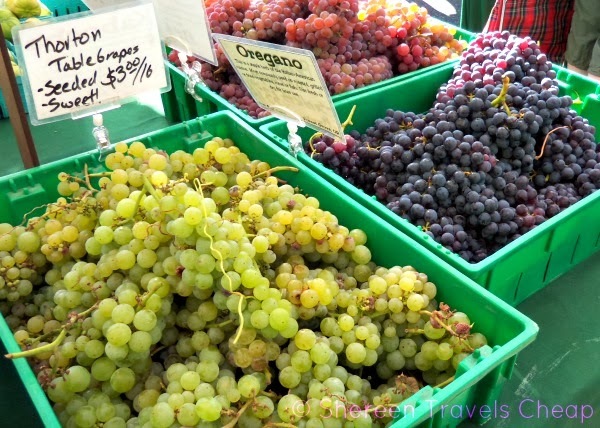 A farmers market is also a fantastic place to shop if you are a vegetarian, have food allergies or travel with children. Save money on healthy snacks and know exactly what your food contains, because you can speak to the makers and growers and they are made with as few natural ingredients as possible. If nothing else, you can check out all the fabulous local produce that a city has to offer and you will get to interact with the people of your trip destination, which can always be a rewarding experience and teach you more about where you are visiting. Plus, the markets are a great place to people-watch and even listen to some local musicians. 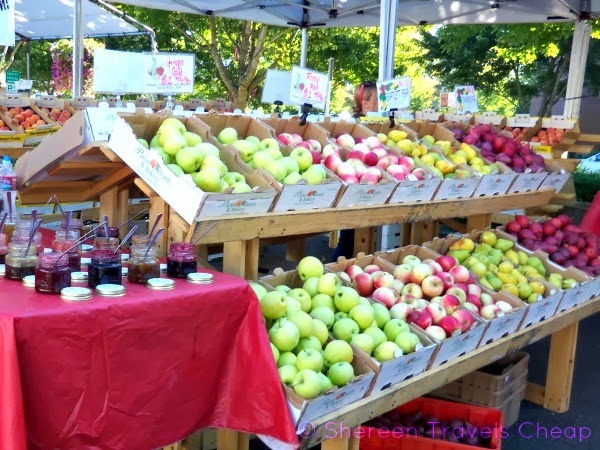 Do you frequent your local farmers market(s) or make it a point to visit ones when you go on vacation?